헤라의 영감은 헤라의 뮤즈, 서울리스타에게서 나옵니다. 이번에 헤라가 새롭게 선보인 매장 디자인은 감각적인 서울리스타의 스커트 주름에서 모티브를 얻었습니다. 새 매장을 선보이는 이번 프로젝트는 프랑스의 말레르브사(社)와 함께 진행하였습니다. 그들의 남다른 감성은 헤라라는 브랜드를 바라보는 또 다른 시각을 보여주었습니다. 새로운 시각을 받아들여 헤라 브랜드에 녹여 기존 고객들도 공감할 수 있는 새로운 헤라 디자인을 완성하였습니다. 고급스럽고 모던한 스타일을 기본 방향으로 집기와 조명 디자인을 진행하였고, 서울리스타의 스커트 주름을 보여주는 패턴을 디스플레이 집기에 구현하였습니다. 헤라의 가장 대표적인 컬러인 바이올렛 컬러를 좀더 무게감 있고 진중한 느낌의 다크 바이올렛으로 조정하여 집기 컬러로 사용하였습니다. 사방이 오픈된 매장 레이아웃은 고객을 과감히 끌어들이는 한편 보다 적극적으로 헤라는 브랜드를 발신하기 위한 장치입니다. 새롭게 바뀐 헤라 매장은 소공동 롯데백화점에서 만나보실 수 있습니다. Hera's inspiration comes from its muse, Seoulista. The newly launched store's interior design was inspired from the fashionable Seoulista's pleated skirt motif. Hera worked on this special project with France's Malherbe Company, using its own unique style to show a different aspect of the Hera brand. From there, we completed a newly designed Hera, infusing with previous ones so that even existing customers can identify it easily. From the furniture to lights, we focused on luxurious, modern style and Seoulista's pleated skirt pattern's motif on display furniture. Hera's representative color, violet, transformed into a heavier, dignified darker violet for use on furniture. 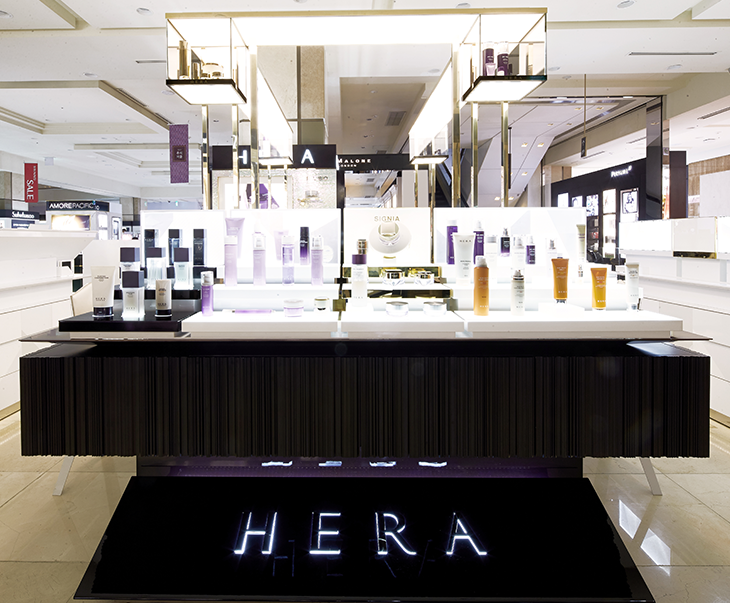 The open space layout draws in customers to show an upgraded, enthusiastic Hera brand. Come check out the newly transformed store at Lotte Department Store in Sogong-dong.